Republic of Ireland manager Martin O'Neill says his players will "go for it" when they visit Poland in Sunday's final Euro 2016 qualifier. O'Neill's side are guaranteed at least a play-off place after beating world champions Germany but a win in Warsaw will secure automatic qualification. 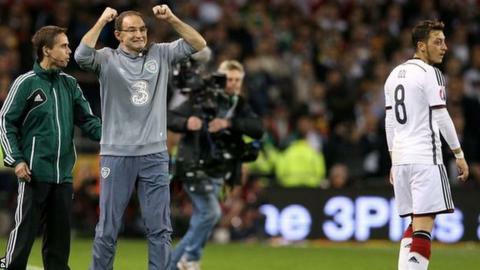 "To beat the world champions is a sensational effort," O'Neill said after Thursday's 1-0 win in Dublin. "We have reached the play-offs and we can go for it on Sunday now." While victory against Poland will ensure the Republic reach a third European Championship finals, defeat will mean they would have to qualify through the play-offs. A 0-0 draw in Warsaw means Poland go through as they will have scored more away goals in meetings between the two sides. A 1-1 draw means the head-to-head records would be identical (as the sides also drew 1-1 in Dublin), but Poland would go through as they have the better goal difference of the two sides. A draw of 2-2 or higher would send the Republic of Ireland through as they will have scored more away goals in meetings between the two sides. The Republic produced a heroic defensive display to condemn Germany to their first competitive defeat since October 2014. The winning goal came from a wonderful finish by substitute Shane Long. "The players put in a fantastic effort," added O'Neill. "We showed bravery and courage. We had to withstand a lot of pressure, which you'd expect, and we did that."